Forgive the personal aside, but our family bought some furniture yesterday, and it wasn’t half bad. We’re moving house, and I’m hopeful it will be the last time for a while; given my personal history that is saying something. By my count this will be my 12th apartment since I graduated from college, and it never made much sense to invest in anything beyond Ikea. Sure, that number is a bit extreme, but from my perspective the optionality that comes from the willingness to move around was worth the packing pain; now that my kids are in school and my career die cast — at least for the time being — the prospect of staying put for more than a year or two comes as a relief. In other words, I’m hitting middle age, with the change in circumstances and priorities that entails. Apple, at least in human terms, is officially over the hill: the company’s 40th birthday was last April. 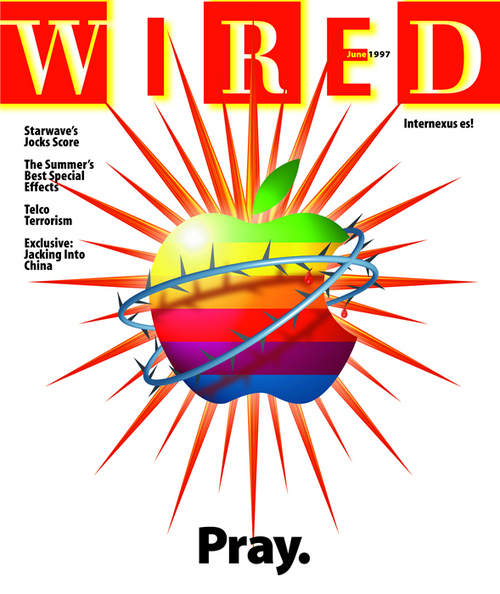 In truth, though, the first Apple died and was reborn in 1997 with the return of Steve Jobs, at a time when the company was weeks away from bankruptcy. For Apple, the Windows version of iTunes is part of a “very slow but real shift” in strategy, said Gene Munster, senior research analyst with U.S. Bancorp Piper Jaffray. “They’ve tried everything to get their installed base to grow, but it just doesn’t grow. What you’re going to see in the coming years is a different Apple.” Ironically, Munster said iTunes for Windows may ultimately help sell more iPods but fewer Macintoshes, because it works well enough with a PC. In fact, the opposite occurred — at least in the long run. The iPod took off like a rocket, dominating the portable music industry until it was killed by the smartphone, specifically the iPhone. And, over time, more and more satisfied iPod and iPhone customers began considering Macs; macOS devices have outgrown the overall market (which is shrinking) nearly every quarter for years. That’s a side story though: while the iPod and the first few editions of the iPhone needed a PC, the latter eventually became independent, an effectively full-fledged computer in its own right. Indeed, most consumer electronics devices now presume that the customer has a smartphone, which makes sense: nearly everyone that has a PC has a smartphone, but there are around a billion people who only have the device in their pocket. And, come Friday, there will be at least one prominent device for sale that requires not just a smartphone but an iOS device specifically: HomePod. The strategy around the HomePod, at least from my perspective, is far more fascinating than the device itself; while it does sound great (at least in the controlled press briefing where I heard it), I have an Echo Dot (and a Google Home-controlled Chromecast, for that matter) connected to my living room stereo that sounds better. Apple Inc.’s streaming-music service, introduced in June 2015, has been adding subscribers in the U.S. more rapidly than its older Swedish rival — a monthly growth rate of 5% versus 2% — according to people in the record business familiar with figures reported by the two services. Assuming that clip continues, Apple will overtake Spotify in the world’s biggest music market this summer. Apple’s music-streaming service has been quietly gaining ground in part thanks to the popularity of the company’s devices: Apple Music comes preloaded on all iPhones, Apple Watches and other hardware the company sells. One interesting angle to [a Taylor Swift exclusive] is that the fact Apple Music exists for Android likely makes it much more palatable for Swift than an Apple-specific service would be. But, that leads to the natural question: what ultimate benefit is Apple deriving from however much they are paying Swift, or from Apple Music as a whole? I know many of you are sick of me asking this question, and, in fact, I am an Apple Music subscriber myself: I find the integration with the Apple Watch to be particularly useful when driving around with two music-loving kids in the backseat of my car. My issue, rather, is about opportunity cost: why can’t Apple architect their platform so that other services can fulfill this low-margin middle-person role, freeing up resources to focus on the sorts of things that only Apple can do? HomePod is the best answer yet, and I have to admit, I’m pretty impressed by Apple’s foresight. Our strategy is always to make the best products…We have the premium part of our line is the 6s and the 6s Plus. We also have a mid-price point, with the iPhone 6 and the iPhone 6 Plus. And we continue to offer the iPhone 5s in the market and it continues to do quite well. And so we offer all of those and I don’t see us deviating from that approach. To be clear, I think this is the exact right approach for Apple…But let’s be honest: that means Apple is not a services company; they have a nice services revenue stream, but the company is rightly judged now and for the foreseeable future on the performance of its hardware. I still think this was the right strategic analysis — Apple’s services differentiate its hardware, as opposed to its hardware existing to push Apple’s services — but it was the wrong financial analysis: Apple’s services may be exclusive to Apple devices,2 but Apple’s install base is so large — 1.3 billion devices, according to Thursday’s 1Q 2018 earnings call — that Services revenue will inevitably rise with a user base that is both growing in terms of numbers and usage, and that is meaningful indeed ($8.5 billion last quarter alone). Apple Music, though, simply isn’t that meaningful financially, though, no matter how fast it has grown: 36 million at $10/month each is just over $1 billion in revenue a quarter (likely less, given that user number includes folks on family plans); more importantly, actual profit may very well be negative, given that the vast majority of revenue goes to record labels and publishers (as a point of comparison, Spotify is reported to operate in the red). It simply isn’t a part of the Services financial story (which is first and foremost the App Store, followed by Google search payments). In this view, Apple Music serves as a “bridge” to translate iPhone market share into smart speaker share; services is a means, not an end, which is exactly what we should expect from a company with Apple’s vertical business model. This fact — that Apple is a vertical company that makes money by selling hardware at a profit — explains two comments by Cook that stood out on last week’s earnings call. First was the insistence that analysts evaluate Apple according to iPhones sold per week, not per quarter, the reason being that 1Q 2018 had 13 weeks while 1Q 2017 had 14. 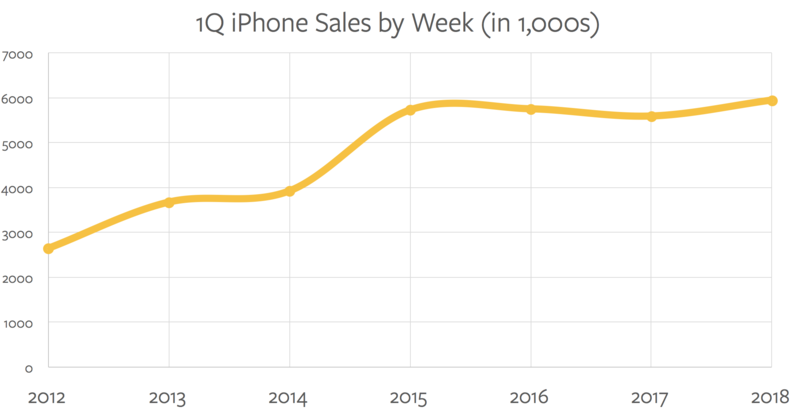 That’s fine as far as it goes: Apple sold fewer iPhones last quarter than it did a year ago, but more per week. A year ago, though, Apple was bragging about “all-time unit and revenue records for iPhone”, when in fact the per-week number was lower than 1Q 2016. Apple’s sudden insistence on per-week numbers is like a company complaining about currency: sure, it matters, but executives only make a big deal out of it when they are trying to divert attention from something else — in this case, stagnant iPhone unit growth. Why, then, was Apple’s iPhone revenue growth up? Well, when you raise prices and a segment of your customer base will only buy the best, you can achieve higher average selling prices — over $100 higher year-over-year ($796 versus $694) — which means higher revenue. Charging its best customers more for iPhones wasn’t the only reason Apple’s revenue was higher, though: remember that Apple is making more off of every customer over time via Services. And there is one more piece: Apple is selling its best customers more and more devices. Apple’s growth is almost entirely inwardly-focused when it comes to its user-base: higher prices, more services, and more devices. This is by no means a condemnation of Apple. Every single move I’ve described above is justified by two circumstances in particular. First, as a general rule, challengers pursue interoperability while incumbents strive for incompatibility. This is Strategy 101: seek to fight battles where you have the greatest advantage. When Apple was making the iPod, its advantage was a superior device; making that device interoperable with Windows let Apple fight the portable music player battle on its terms. Today, though, Apple already has dominant market share: better to make its devices exclusive to its ecosystem, preventing rivals from bringing their own advantage (superior voice assistants, in the case of Alexa and Google Assistant) to bear. Secondly, the high-end smartphone market — that is, the iPhone market — is saturated. Apple still has the advantage in loyalty, which means switchers will on balance move from Android to iPhone, but that advantage is counter-weighted by clearly elongating upgrade cycles. To that end, if Apple wants growth, its existing customer base is by far the most obvious place to turn. In short, it just doesn’t make much sense to act like a young person with nothing to lose: one gets older, one’s circumstances and priorities change, and one settles down. It’s all rather inevitable. Keep in mind, the swashbuckling Apple — the one led by Steve Jobs, not Tim Cook — that looms so large in everyone’s imaginations, couldn’t have had more different circumstance. Jobs was a product and execution genius, but in truth we have no idea how he would deal with the strategy questions facing Cook. Making iTunes for Windows was as correct strategically as is making HomePod exclusive to iOS devices; that the former fits ones’ mental model of how a company “should” operate is a matter of circumstance, not principle. So it was for every Jobs decision: expanding the iPod market with the Mini wasn’t disrupting itself, it was a means of making more money. An even starker example is the iPhone: cannibalizing oneself is a whole lot less impressive when the cannibalizing product has a higher ASP and higher margins. This is to take nothing away from either decision, simply to note that it’s a lot easier to make decisions everyone loves when the overall market is growing. The fact of the matter is that Apple under Cook is as strategically sound a company as there is; it makes sense to settle down. What that means for the long run — stability-driven growth, or stagnation — remains to be seen.